Mostly doing nothing, usually. After the weekend where I don’t get to see Max too much we normally just take the day to totally veg out together. Today I’m thinking of getting a lot done…a LOT. There’s a lot of cleaning and organizing I’d like to do around here! Our problem is space. We don’t have a lot of it. But we could probably make better use of the space we do have. The problem is clutter. None of it is Dan’s really. It’s mostly my junk that I have collected, and lots and lots of excess toys for Max. My plan is to purge a lot of that before his birthday but since I’m not really sure what to get rid of and what to keep I’m just going to pay more attention to what doesn’t get played with over the next couple of months. Today is also an update on my food post from Friday. I did pretty well even though I was surrounded by delicious desserts for most of the weekend at work. I’ve done mostly raw all weekend. The things that weren’t raw were: 1 hard boiled egg, 1 sliver of raw goats milk cheese, 1 sliver of raw cows milk cheese, 1 vegan whoopie pie, and 1 beer. Not all together. Probably obvious buuuuuuut I figured I would explain. Everything else has been greens, veggies, fruit, grains and nuts. I feel mostly pretty good so far. I’m about to start today with a green smoothie and steel cut oats with blueberries and maple syrup. I’m going to let Max get reaaaaaaaally messy in his booster seat with the oats while I do up the dishes and then it’s an early bath time for that guy. I’ve found so far with this diet that as long as I add in extra meals I don’t feel hungry or deprived and actually have pretty good energy levels for the most part. So, I’ll have and extra meal between breakfast and lunch and between lunch and dinner with lots of little snacks mixed in. Max will eat the same thing I am so we’ll both be healthy and feeling good. Signing off now- we’re hungry! Other items that have been really yummy for us in the past are mixed olives- I love the lemon and garlic variety, rice cakes with almond butter, apple slices and dark chocolate chips. We often get into dinner ruts, too. We’re cutting out most animal products and focusing our dinner time on vegetables, beans and fruit. This week we’re going to have miso soup quite a bit. We make ours with barley miso paste, cabbage, carrots, green onions, soba noodles, ginger and a bit of rice wine vinegar. I think it’ll be really yummy with lots of garlic, too. Veggie burgers were on sale so I bought a couple of boxes, but next week I’m going to be making a couple batches of homemade bean and veggie burgers to keep in our freezer. Another favorite meal for all of us is chickpea curry with brown rice. Lunch isn’t a big affair- Max and I usually just have something light, Lately he has been loving avocado chunks and I like to roast sweet potato wedges for lunch. Grain salads are great for lunch and dinner! I can’t wait for summer time and tomatoes with every meal! 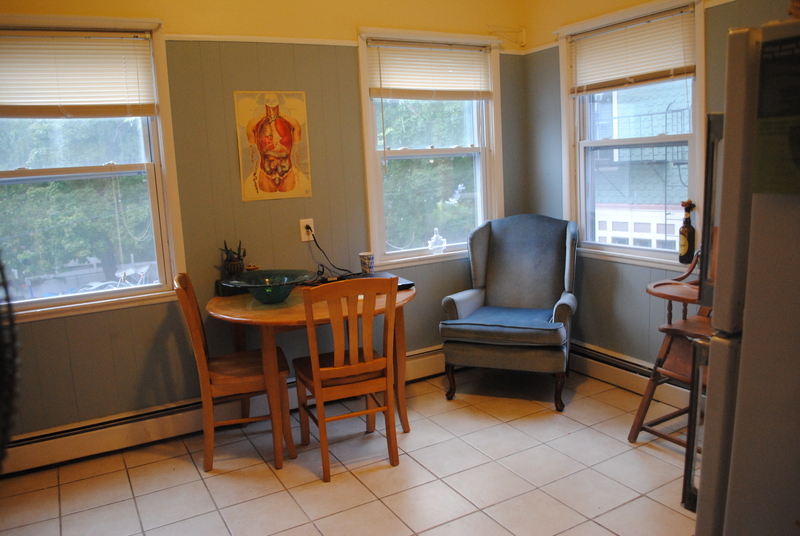 Yesterday’s “This Time Last Year” feature reminded me that last year my kitchen was clean. I mean, insanely, super clean. Now it’s full of stuff. Lot’s of stuff. Trash waiting to go out to the barrel. Lots of recycling waiting to go out to the bins. Boxes of wedding stuff. Bags of out of season clothes, clothes to donate, hats/gloves/scarves for this coming winter. The counter is covered in things that don’t have a home anywhere else. At this exact moment it is also covered in clean dishes that I just need to put away, which is better than dirty dishes I guess. Our fridge needs a good scrubbing out. Sigh. I’ll get to it, right? Anyway, here it was last year. 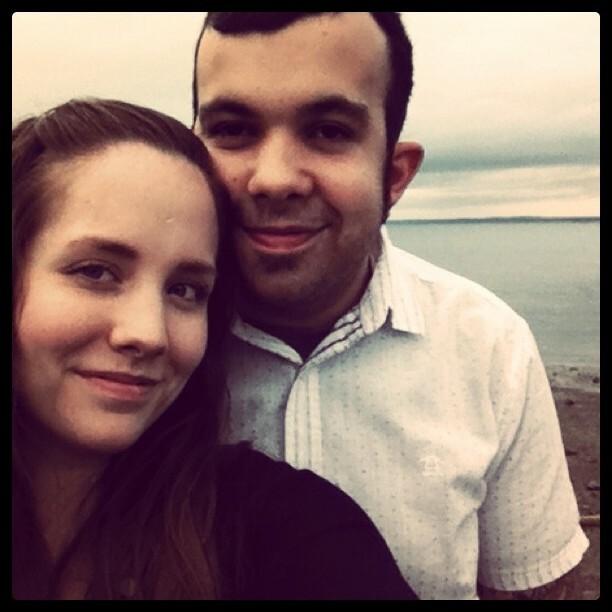 I am not posting a current photo, nope! Not doing it! I’m totally not into seafood but Dan is and he really wanted a Maine lobster on his birthday. I’ve never seen anyone dig into a lobster before. Wow…what a mess! I had awesome french onion soup and a big caesar salad. It was a tasty meal! 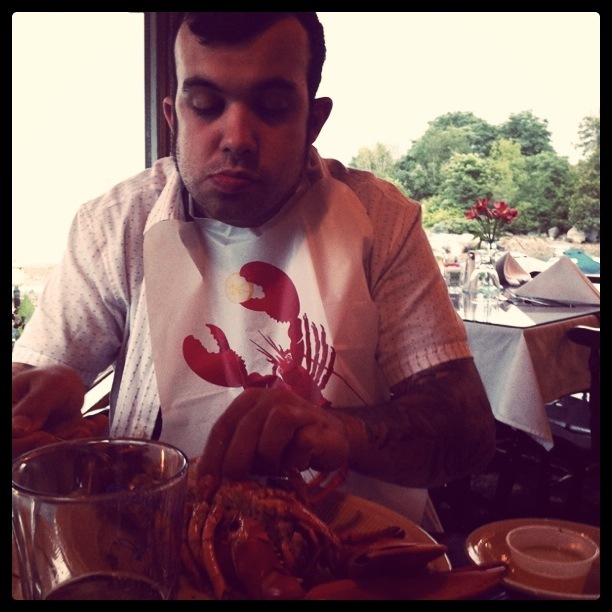 Ahahaha, lobster bib. Hilarious. 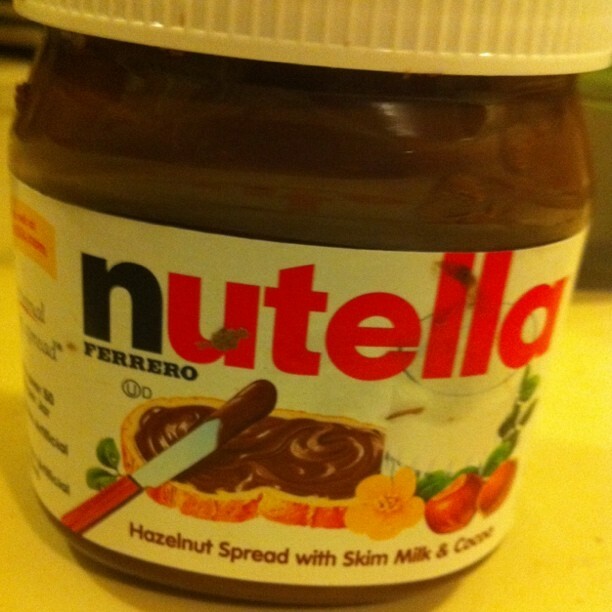 Who doesn’t love Nutella? It’s not something we usually buy. But the other day I did buy some. And oh man, it’s good. I can’t take credit for this idea but it was damn delicious- you should try it! 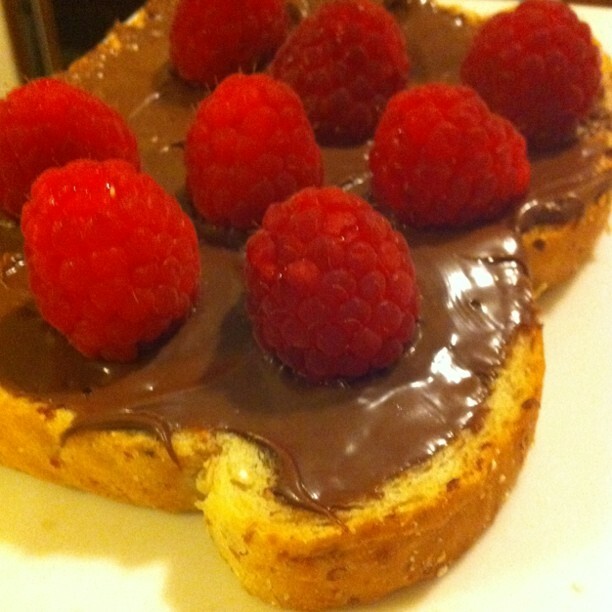 Open-faced nutella sandwich with raspberries. I used oatmeal bread but you can use whatever you have. The bread isn’t the important part, it’s the chocolatey-hazelnut goodness on top that counts. It was all I could do to resist going back into the kitchen to make another one. Or did I? You’ll never know. I originally thought this post was going to have deliciously beautiful photos of the pie I made last night. After baking, a slice on a plate, etc. That didn’t exactly work out too well…I’ve never made a blueberry pie so I googled it and quickly stumbled on an easy method on The Pioneer Woman. Dan brought some blueberries and a premade pie crust home to me. How could it be any easier? I eyeballed the sugar and the nutmeg. Yeah…way too much. Sweetest pie I’ve ever had. Woah. Sugar coma. And the pie wasn’t a pie, so much as a mountain. Epic baking fail.